When I was a kid, I lived across the street from Bon Jovi. Okay, maybe it wasn’t THE Jon Bon Jovi, but he sure looked like him! Our teenage neighbor had the same beautiful long hair and similar facial features to the 80’s rock icon. We adored him. When I say we, I mean my older sister, Deven and I. She was 10 years my senior and introduced me to the finer things in my young life. Hair metal music being a huge part of those “finer” things. Dev used to tell Brian and I stories about Princess Chrissy and Prince Brian, who would always marry Jon Bon Jovi and Cindy Crawford, respectively before bringing them back to the kingdom of Flaherty’s to meet King Daddy and Queen Mommy. Childhood obsession? Maybe. Totally awesome? Definitely. We had a hamster named Jon Bon Jovi (after Axel Rose, the gerbil, died), and would watch MTV–back when MTV really was MUSIC television–to catch glimpses of my love. I looked up to my big sister as a role model, and what she liked…I liked. So when we (she) discovered that the neighbor boy looked like JBJ, we planned a stake out. Owning a motor home had its perks, one of which meant an easy driveway camp-out for a couple of teenage girls and a five year old tag-along. We brought our sleeping bags, pillows, and snacks out to the camper, and set up shop. With a radio to listen to some of Jon’s newest hits, we sat in the camper waiting…and waiting…and waiting. Dev and her friend Melissa were content just to stare out the back window for “Jon,” but I wanted to play. Of course, I had dragged out quite a few toys and games to play with, but as per the usual, no one really wanted to play with me. I remember that as soon as “Jon” entered or left the house, the girls would giggle and squeal, totally excited to get just the smallest glimpse of him. I would race to the back of the camper, jump up on the bed, and beg to see out the window with them. They’d barely let me squeeze in, but I made it through to see the hottie across the street. I always wondered why they never wanted to talk to him, but I was five, so their logic was beyond me. I guess it made sense. I can remember when my mom and aunt took Dev to see Bon Jovi on the Slippery When Wet tour. I was super jealous that I couldn’t go. 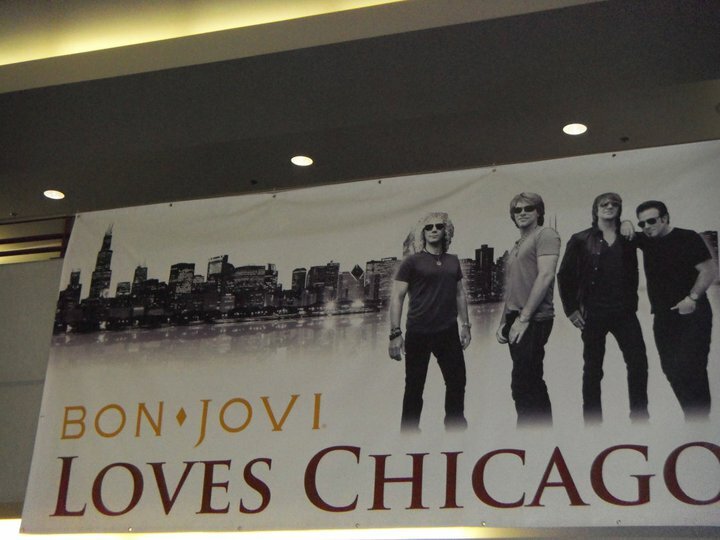 A decade later, Bon Jovi returned. And I was finally old enough to see him. I made my way to the Chicago stop on the It’s My Life Tour at Allstate Arena with one of my best buds. I had purchased tickets the morning they went on sale, and we were on the floor in the 18th row. It was the best show I had ever been to. The One Wild Night Tour, a year later, was a reboot of the same show, and it too was stellar. Another decade went by, and Bon Jovi went country. This saddened me a little, but when the opportunity to see him in March of 2011 for the Bon Jovi Live Tour, I couldn’t pass it up. Especially when it included a backstage tour before the show. Rock. The. F. On. Thanks to some friends who had an “in,” we got to check out all of the cool Bon Jovi behind the scenes action. The view from down low. 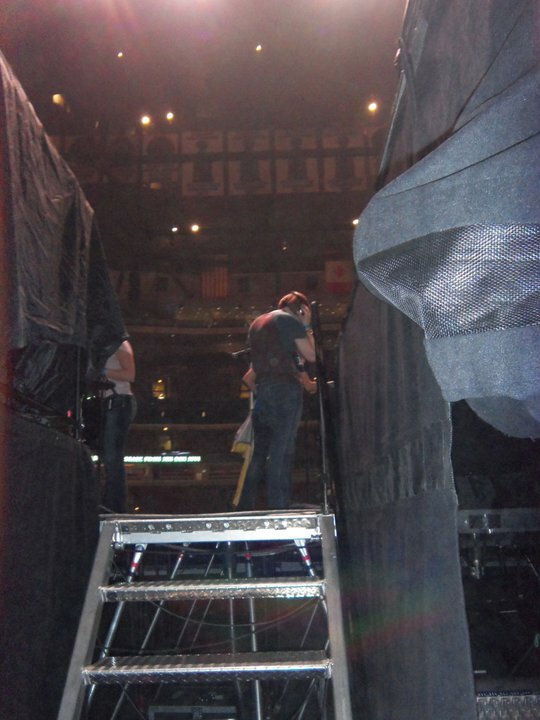 This is where Jon enters the stage! 20 some odd years later, and I still heart Jon.